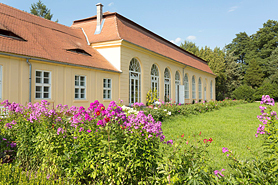 The former summer residence of Transylvania governor (Baron) Samuel von Brukenthal now welcomes guests interested in history, outdoors and great authentic foods. Built in the mid-1700's on a 40-acre domain, the Brukenthal Residence – Avrig is one of the finest examples of late-Baroque architecture in Transylvania. The 12 rooms available for overnight guests are large, bright and simply furnished (three-star rating). All rooms have comfortable beds, cable-TV, free Internet and private baths with all modern amenities. 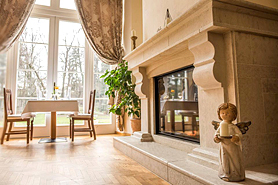 Restaurant, bar, Orangerie, event rooms, botanical park, souvenir shop, museum (medieval art and crafts). The restaurant serves dishes prepared according to secret Transylvanian recipes, using ingredients from the palace's own garden. All taxes and breakfast are included. Nature walks, visits to traditional villages, local foods and drinks tasting, horse-back riding, visits to the local glass-workshop. Sibiu – beautiful medieval and Transylvania's cultural events capital. Southern Transylvania Saxon fortified churches. Brukenthal Residence is the ideal start or end point for a Trans-Fagarasan scenic drive over the Carpathian Mountains.